This is the title of an article in the Hastings and St. Leonards Observer, that has been signed by Amber Rudd. Amber Rudd is the Home Secretary and in this year’s General Election, she retained the Hastings and Rye constituency with a majority of just 346 votes. As I doubt she wants to commit political suicide, I therefor consider that what is said in the article is very close to what is intended to happen about the delivery of faster trains between London and Hastings. This is the first two paragraphs of her article. Last week I invited Transport Secretary Chris Grayling to visit Ashford International to hear an update on my campaign to secure a high speed rail link between our communities and London St Pancras. Specifically, I want to see journey times, which are currently around 100 minutes between Hastings and London, reduced to 66 minutes. The sixty-six minutes is mentioned again later in the article. Would a politician be so definite about her aims, unless she knew that it was deliverable? Or is it lucky to say sixty-six in Hastings? So how feasible is London to Hastings in 66 minutes? Southeastern’s Highspeed services between St. Pancras and Ashford, generally take between 37-38 minutes for the journey, with some trains a few minutes faster. The operating speed is quoted in Wikipedia as 60 mph. There are some serious level crossings. So could a train go from Ashford to Hastings in twenty-eight minutes to meet Amber Rudd’s quoted target of 66 minutes? 26¼ miles in 28 minutes works out a an average speed of 56.25 mph. I would give that time a 9/10 for feasibility. The problem would be the level crossings on the line, so if Network Rail were to remove these and improve the track a bit, I feel that this could even score highly for reliability. Currently, there doesn’t appear to be many trains passing through and even if the service was doubled to two trains per hour in both directions, I don’t think they would trouble the timetable compiler. Amber Rudd’s article then says this about track changes at Ashford. Work will now begin towards the necessary track connections to join-up the Marshlink and the High Speed 1 line to London. This change would help make possible the direct service to St Pancras with a journey time of 81 minutes from Hastings. That seems to be a plan. But where does the 81 minutes come from? The current Class 171 trains take around 42 minutes between Hastings and Ashford, so 38+42 would say that 81 minutes is a reasonable claim. This document on the Network Rail web site, is the Technical Appendix of the South East Route: Kent Area Route Study. This map was extracted from the document. This shows the changes needed to connect HS1 to the Marshlink Line. Amber Rudd’s article says this about the trains. Accompanying the track changes at Ashford, hybrid rolling stock – trains running on diesel-electric or battery-electric power – would make these quick journey times a reality. This fits in with what is said in the Technical Appendix to the Kent Area Route Study. The diesel electric train mentioned in the Technical Appendix is a Class 802 train. Production and delivery of these is underway for Great Western Railway, so we’re not talking about an untried class of train. But there may be problems running trains carrying diesel fuel in the HS1 tunnels. The battery-electric train mentioned in the Technical Appendix is the IPEMU based on a Class 379 train. 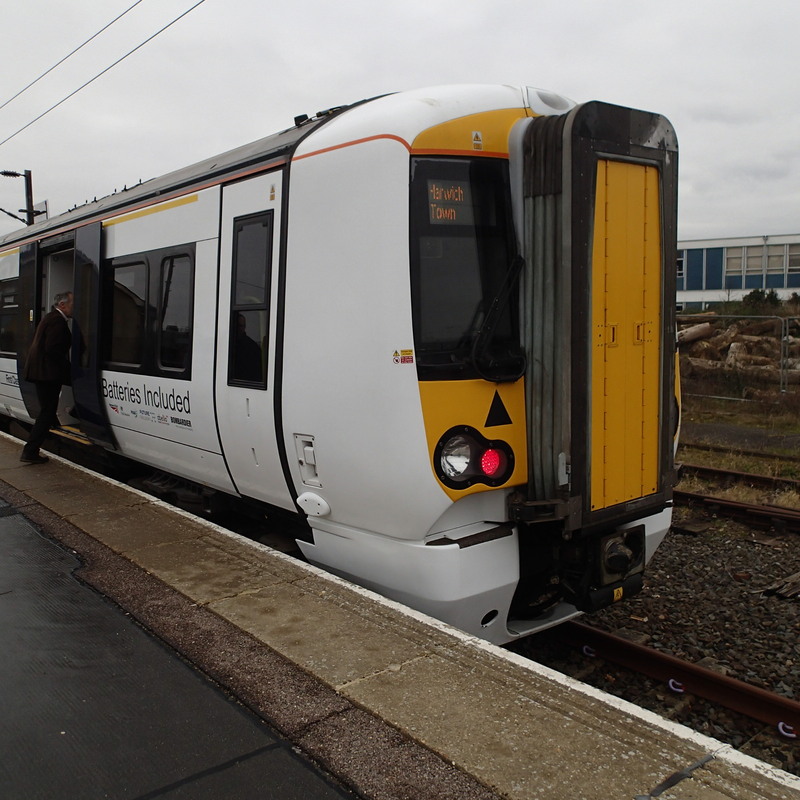 This train is not in production yet and the picture shows the test train, that ran in Essex nearly two years ago. The Technical Appendix says this about the IPEMU. Note the following from Network Rail’s text. Brighton to Ashford is about 60-70 miles. The Class 377 train would not be suitable for HS1, as it is only a 100 mph train. It is my opinion, that a battery-electric train with the following characteristics could be designed. 140 mph on HS1 using 25 KVAC overhead electrification. 100 mph on the East Coastway Line between Brighton and Hastings using 750 VDC third-rail electrification. Class 171 train performance using batteries on the Marshlink Line. A battery range of sixty miles to allow a fully charged train to go from Ashford to Hastings and back. Effectively, it’s a dual-voltage high speed train, that can also run on battery power. How Would A Battery Train Operate? A train working from St. Pancras to Hastings would go through the following operations. Run from St. Pancras to Ashford along HS1, as the current Class 395 trains do using the 25KVAC overhead power. Stop in Platform 2 at Ashford station and switch to battery power. Run to Hastings on battery power. Run to Aahford on battery power. Stop in Platform 2 at Ashford station and switch to 25 KVAC overhead power. The battery would be charged on HS1 and using the third-rail electrification at Hastings. How Big Would The Battery Need To Be? The test IPEMU had a battery capacity of 500 kWh and based on what is said in the Technical Appendix was capable of perhaps 150 miles on battery power. This works out as a consumption of under one kWh per car per mile. So a six-car train would need perhaps 200 kWh to do a single trip on the 26¼ mile Marshlink Line. Providing of course it was fully charged before starting the journey. Could Hitachi Modify a Class 395 Train To Have A Battery Option? Hitachi have been developing battery trains for several years. I believe that if Bombardier can create and test a battery-electric version of a Class 379 train, in under a year, then Hitachi could do the same with any of their A train family, which includes Class 800/801/802/395 trains. This page on the Hitachi web site is entitled AT300 – INTERCITY HIGH SPEED. The page has a picture of a Class 395 train and it has this caption. Underneath the picture, it gives a Technical Outline for the trains, where this is said. This may only be for train hotel power, but certainly the trains can use batteries. I have no reason to believe that St. Pancras to Hastings copuldn’t be run by either type of train. Although there is the problem of whether trains carrying diesel can go throyugh the HS1 tunnels. The new operator for the Southeastern Franchise will chose the deal they liked. The Technical Appendix to the Kent Area Route Study proposes three possible destination stations. Hastings station has some advantages. It may be easier for operational reasons. Using Platform 1 would allow cross-platform interchange with trains going West. Only minimal signalling and track changes are needed. A 25-30 minute dwell time at the station is good for recovery after a late arrival. The big disadvantage is that Bexhill will not be served. Stakeholders would like the service to go to Bexhill station. Train operation doesn’t appear to be as simple as at Hastings. Eastbourne station also offers advantages. There could be a 20-25 minute dwell time at Eastbourne, which would help in service recovery. Sic-car trains would offer signification extra capacity between Hastings and Eastbourne, where it is needed. The line between Bexhill and Eastbourne was resignalled in 2015. Eastbourne to St. Pancras would be a good alternative route in times of perturbation. With extra work at Hampden Park station, it could provide a faster route to Brighton and Gatwick Airport. The only disadvantage is that an extra train would be needed to run the service. All three stations could be a suitable destination. I feel that if the choice of trains favours battery-electric, that Eastbourne might have a useful advantage in recharging the batteries. The Technical Appendix to the Kent Area Route Study proposes various track improvements in various places from Ashford to Brighton. It looks like Network Rail are preparing the infrastructure for faster services all along the South Coast. Amber Rudd has put her name to a well-worked article. Could Class 800/801 Trains Work Southeastern Highspeed Services? Southeastern Highspeed services are run by Class 395 trains. These trains are capable of the following. 140 mph running on HS1. Joining and separating in under a couple of minutes. As the electric Class 801 trains are also members of Hitachi’s A-train family, I’m sure that they could built to a similar specification. The trains are capable of 140 mph on suitable lines. Rhird-rail gear can probably be easily added. The joining and separating is in the specification. So I think the answer to my question must be in the afformative. Could London Introduce Lifts With Inbuilt Ticketing? Use the Underground or the trains in London and you have to have to touch in and out with your contactless ticket, Oyster card, smart phone or Freedom Pass. Suppose you want to put lifts into a station, where putting the lift inside the ticket barriers would be difficult, but perhaps putting it outside on the street would be easy. This technique has been used at Bank station to provide step-free access to the Docklands Light Railway. When I called the lift to enter the station, the lift was sent by an operator in the Control Room. So why not combine an outside lift with the ticketing? Perhaps to call the lift, you need to touch in or out?